The Kam Wah Chung and Company (Jin huachang ‘Golden Flower of Prosperity’) was a Chinese-owned grocery, dry goods store, and clinic in John Day. 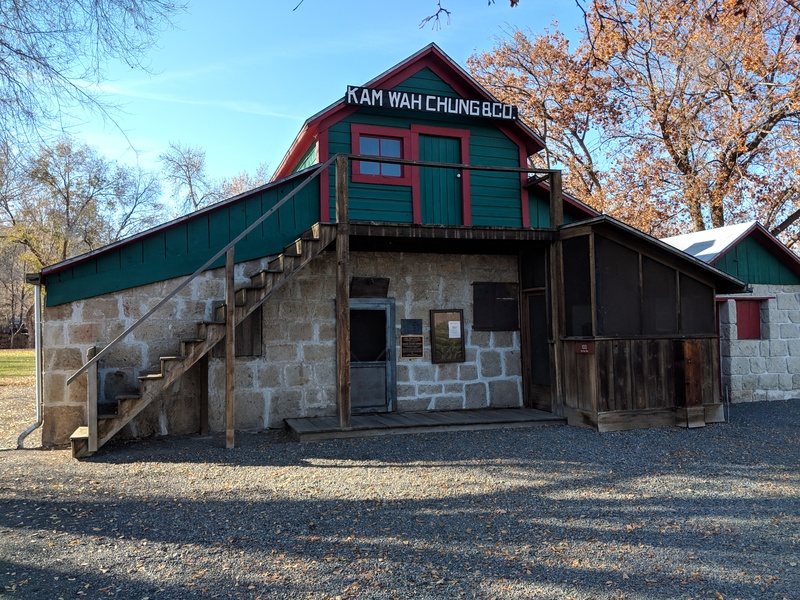 Established in 1871 as a contractor of Chinese labor, The Kam Wah Chung and Company operated during the height of Grant County’s influx of Chinese gold miners and laborers (1870-1910). A business partnership formed in 1887 at The Kam Wah Chung with entrepreneur Lung On (Liang Guangyong, also known as Leon) and herbalist Ing Hay (Wu Yunian, also known as Doc Hay). The survival and longevity of the Kam Wah Chung, from its official re-opening in 1888 until it closed in 1948, are remarkable. 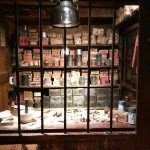 It was the only Chinese-owned mercantile and apothecary store in eastern Oregon to have weathered both racism and the shift of its clientele to non-Chinese patrons. By 1887, John Day’s Chinese community included three stores, a temple, a laundry, temporary housing, vegetable gardens, and a stocked fish and duck pond. The Kam Wah Chung building is all that remains of these structures. The building had seven rooms, including a stock room and general store, private and bunk-style sleeping quarters, a kitchen, a common room, and an apothecary shop. 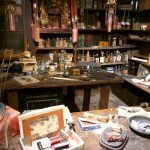 In addition to tools, clothing, and staples such as flour and sugar, The Kam Wah Chung sold imported goods such as rice, soy sauce, ginseng, Chinese medicine, and medicinal herbs. Ing Hay’s medical skills—pulse diagnosis and traditional Chinese herbal remedies— earned him Chinese and non-Chinese patients from throughout Oregon and from states as distant as Alaska and Oklahoma. The Kam Wah Chung’s financial success was such that Lung On passed away in 1940 and Ing Hay’s nephew Bob Wah moved to John Day to apprentice with his uncle. The Kam Wah Chung and Company closed in 1948. In 1955, three years after the death of Ing Hay, Bob Wah deeded The Kam Wah Chung building to the City of John Day to be used as a museum. When volunteers opened the building years later, there was still food in the kitchen and medicinal herbs on the apothecary table. The building contains thousands of Chinese artifacts from the late 19th and early 20th centuries including over 500 Chinese herbs, prescriptions, letters and business records, In 1973, The Kam Wah Chung Company was listed on the National Register of Historic Places and in 2006 it was named a National Historic Landmark. This site run by Oregon State Parks, open daily May 1 – October 31, 9 a.m. – Noon, 1 p.m. – 5 p.m. Guided tours only. Tours start at the top of each hour at the Interpretive Center and last about 45 minutes (last tour at 4 p.m.). Free tickets for the tour can be picked up at the Interpretive Center. Please visit Friends of Kam Wah Chung to learn more, and about events that are held. 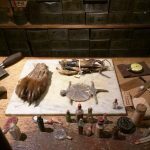 Kam Wah Chung- the counter of Ing Hay’s apothecary shop. Photo by Don Hann, Malheur National Forest. Kam Wah Chung- Ing Hay’s medical herbs. Photo by Don Hann, Malheur National Forest. Kam Wah Vhung General Store. Photo by Don Hann, Malheur National Forest.